Will it fend off the appeal of the formidable Fiesta ST? 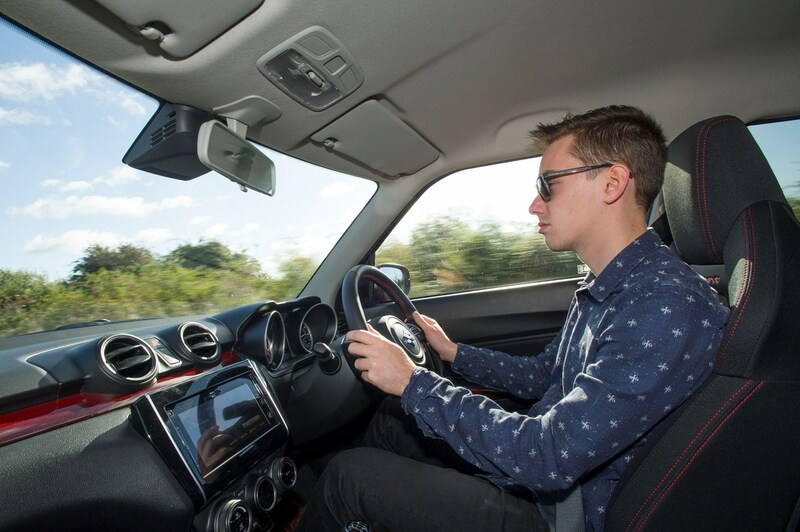 This week's update: James likes the Swift Sport, but does the rest of the Parkers team. In this week's update, office opinions on the red rocket are shared. And it's fair to say that some are bigger fans than others. Before I officially welcome the 2018 Suzuki Swift Sport to the Parkers long-term fleet, I should probably explain the picture above. Although it appears that I have spontaneously decided to ‘lift’ my new long-termer clean off the ground and grin proudly at the camera, there is method to my madness. 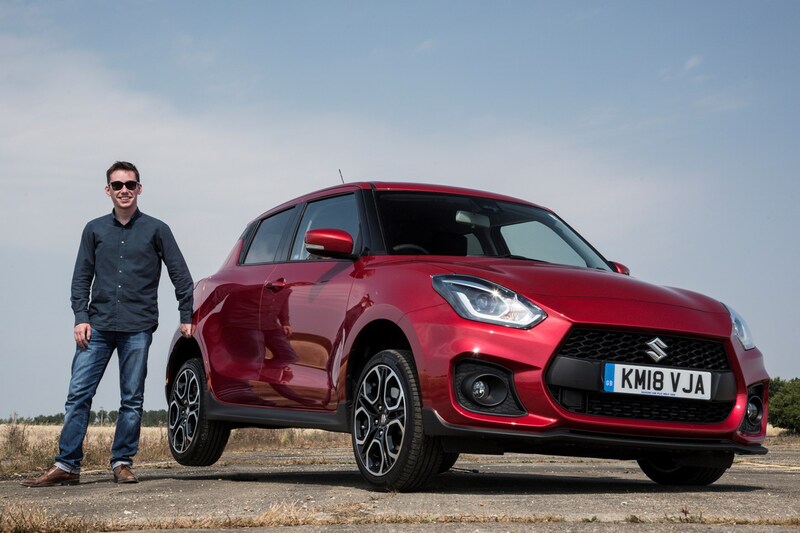 See, the Swift Sport weighs in at a scarcely believable 975kg ­– considerably lighter than the Volkswagen Up GTI, Ford Fiesta ST and, impressively, the previous generation Suzuki Swift Sport. 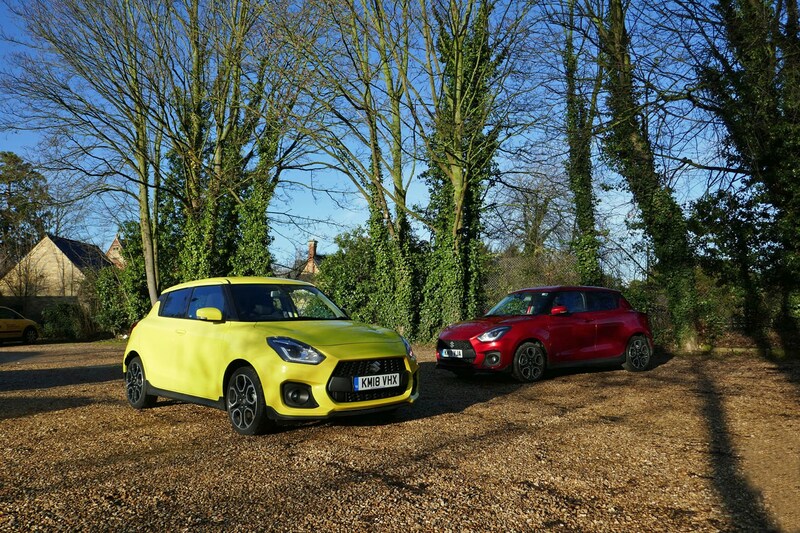 Indeed, you’ll struggle to find a performance hatchback built during the last few years that betters the 2018 Swift Sport for sheer featherweight supremacy. So, in a world where mainstream performance cars are only getting heavier, does the Swift Sport’s strict diet mean it is the ultimate pocket rocket? Or is the modern petrolhead’s yearning for a lightweight sports model misguided? Two questions I intend to discover the answer to during my six months with the Burning Red Pearl Metallic Suzuki. 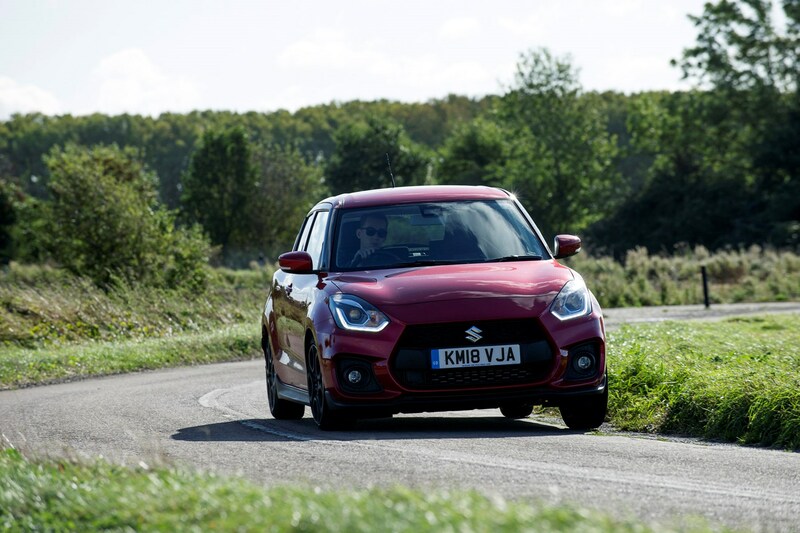 But before that, read on for the full skinny on the Swift Sport. 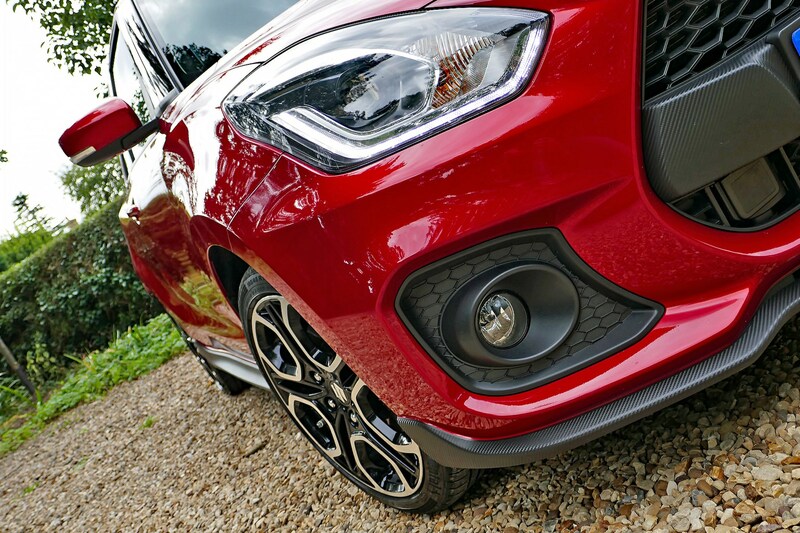 Being the priciest Swift you can currently buy, the Sport comes with an impressive array of standard equipment designed to improve the driving experience and make the car easier to live with on a day-to-day basis. I’ve got a fairly hefty commute that the Swift Sport will have to tackle on a daily basis, so I’m curious to see how effective the equipment is in the real world. Is it genuinely useful, or just for show? The vital numbers are a 1.4-litre four-cylinder Boosterjet engine producing 140hp and 230Nm. Not exactly figures to set the pulse racing, but couple them with the car’s minimal kerb weight and it’s enough for 0-62mph in 8.1 seconds and a top speed of 130mph. Not too shabby. Early impressions suggest the real-world pace is even more impressive than the figures, too, with the healthy torque figure enabling surprisingly brisk in-gear performance capable of surprising cars with far more outright power. 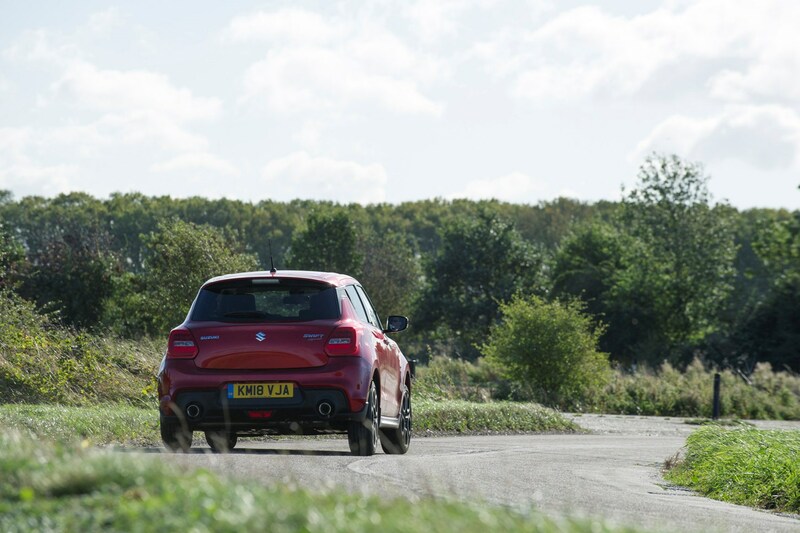 Colleague and fellow performance-car enthusiast Adam Binnie has already had to come to terms with the fact his 230hp Skoda Octavia vRS can’t outrun the Swift Sport in a straight line. It’s going to crop up at some point during my six months with the Swift Sport, so I may as well explain the issue of the Fiesta ST now. See, the Swift is priced from £17,999, and the Fiesta ST-1 at £18,995. Closely matched, but not identical. 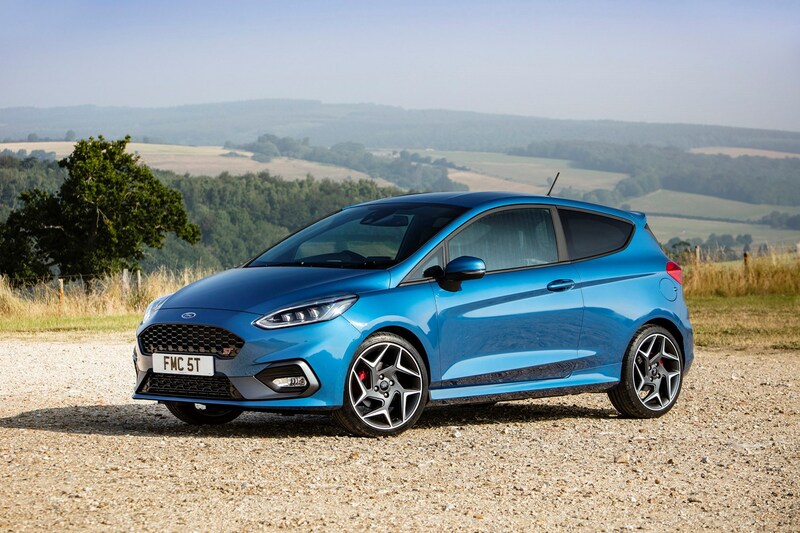 Translate that into a finance agreement, however, (36 months, £2,000 deposit, 12,000 miles per year) and it comes out at £311 per month for the Fiesta ST-2* (with Performance Pack) and £310 per month for the Swift Sport. So, equal money, equal cars, no? We shall see. That said, the Fiesta ST-2 is almost £2,000 more to buy outright at the end of the three years (£8,855), however the majority of buyers do not take up this option. A tough ask to live with the Fiesta ST, then, but I’ll be giving the Swift Sport every opportunity to showcase its talents during my six months with it. Can I put it down now? *Fiesta ST-2 is cheaper than Fiesta ST-1 on finance. 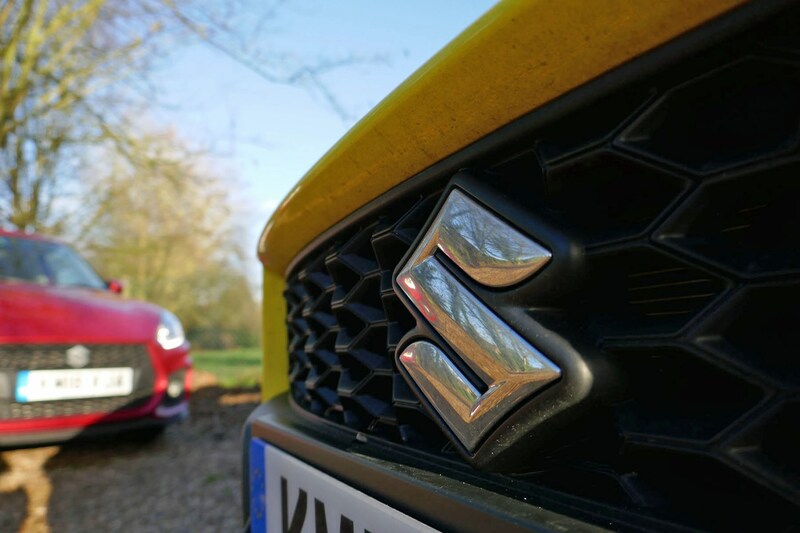 I’ve been making swift progress (sorry) on the mileage front recently, so I thought I’d share my first impressions on the Suzuki. Sufficed to say, I’ve been pleasantly surprised. My ‘surprise’ at the Swift Sport’s competence stems from the international launch of the car I attended earlier this year. After driving the car for the first time I thought it was quick, but short on fun, and the steering was disappointingly sterile. Back in the UK, however, and while the stirring performance is still apparent – I’ll never tire of the in-gear flexibility surprising drivers of far more powerful cars – it’s the overall handling and fun-factor that has made the biggest impression. 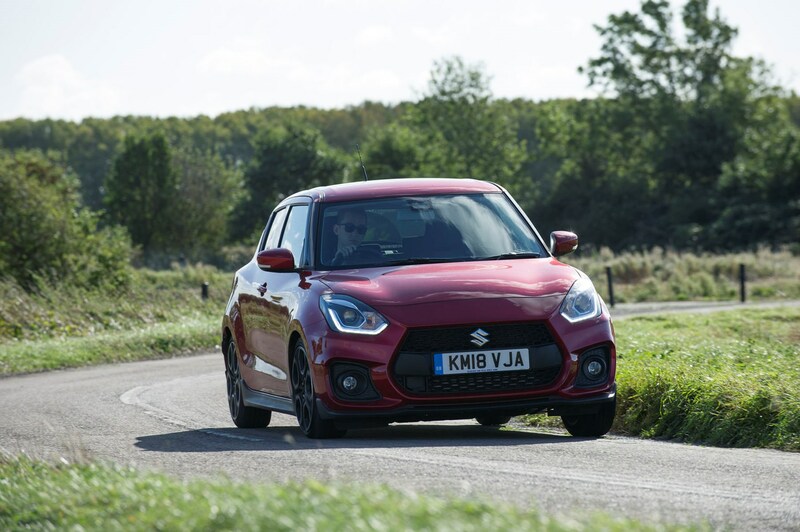 Perhaps it’s because the Swift Sport’s diminutive size and kerb weight are better suited to narrow, twisty UK roads rather than the smooth, wide open Spanish tarmac we had on the launch, but this little Suzuki is proving rather enjoyable. Don’t get me wrong, it still doesn’t feel as engaging or communicative as the best hot-superminis past and present, but there is genuine appeal to the way it darts from A to B so tidily. 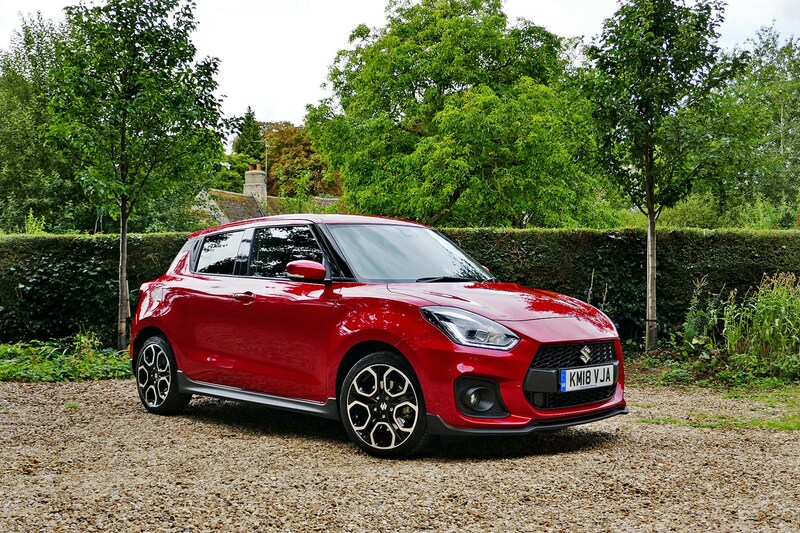 Bumpy B-roads that would make a supercar driver squirm are the Swift Sport’s element, as it merrily gobbles up apex after apex, all with very little drama. It does require some patience, mind – since there’s no fancy limited-slip differential at the front. Getting back on the throttle at corner exit without lighting up the front wheels is a precision task. 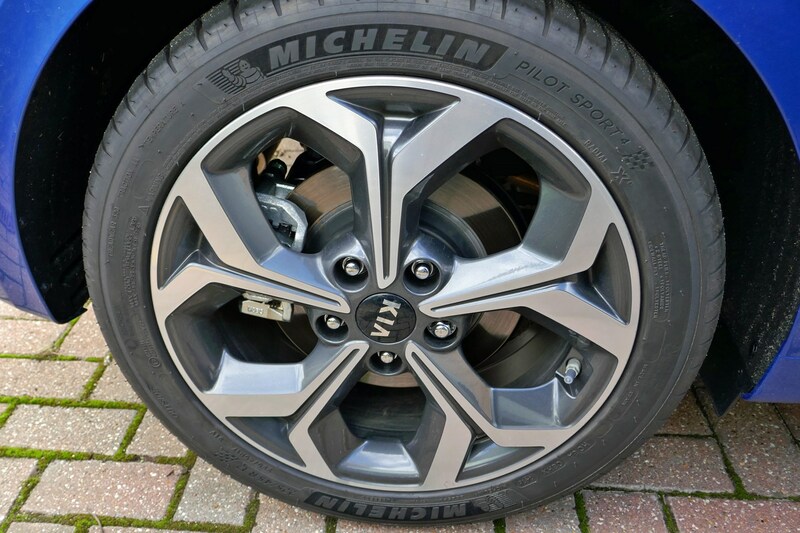 The stopping power, too, is something to behold. That said, the steering is still completely dead and offers zero feel aside from the annoying judders you get when hitting in an imperfection in the road mid-corner. Can’t have everything I guess. I was concerned about how this would turn out, but so far, so – relatively – good. The touchscreen graphics are clear but primitive and the responsiveness pretty poor, but it will hook up to my phone, display contacts and play music. So we’ve currently got a working relationship. I’m yet to try the sat-nav (I’m a devout Waze user), but plan to give it a runout in the coming weeks. One other thing I noticed – when filming our Alpine A110 vs Porsche 718 Cayman video – was that the former shared an infotainment system with my Swift Sport. Curious. There’s nothing wrong with analogue speedometers in general, but the Swift Sport’s has – in my opinion – all of the wrong speeds marked. It’s also got a chunky needle, too, that makes it hard to see exactly what speed you’re doing. This wouldn’t be an issue if the handy colour screen on the dashboard was used to offer up a digital speedometer but, alas, for some reason it isn’t. Also, the autonomous emergency braking system (useful as it is in the event of a potential accident) is annoyingly over-sensitive. Even if I’m on the brakes approaching a stationary car, it still bleeps loudly at me, misreading the situation. I’ve yet to check if you can turn it off, but even if you could, doing so would create a whole manner of insurance headaches I’d rather avoid. 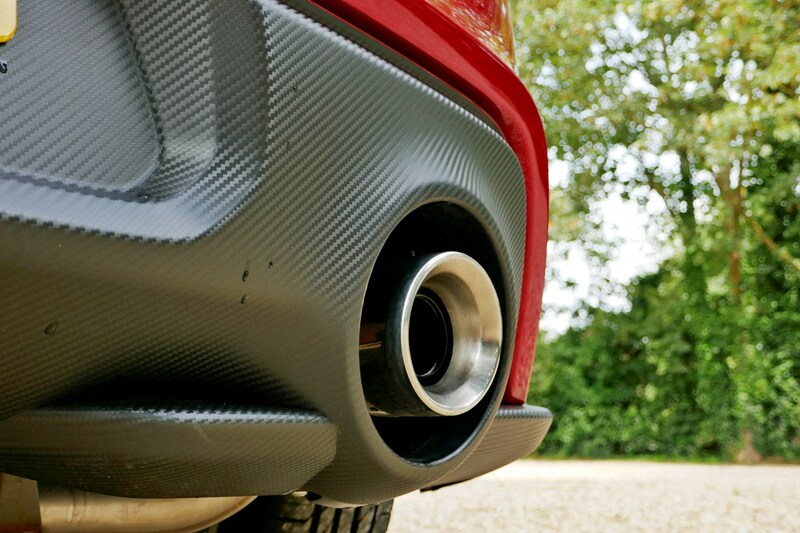 Our eagle-eyed Editor of Parkers Vans, CJ Hubbard, has spotted something unusual on my Swift Sport long-termer. 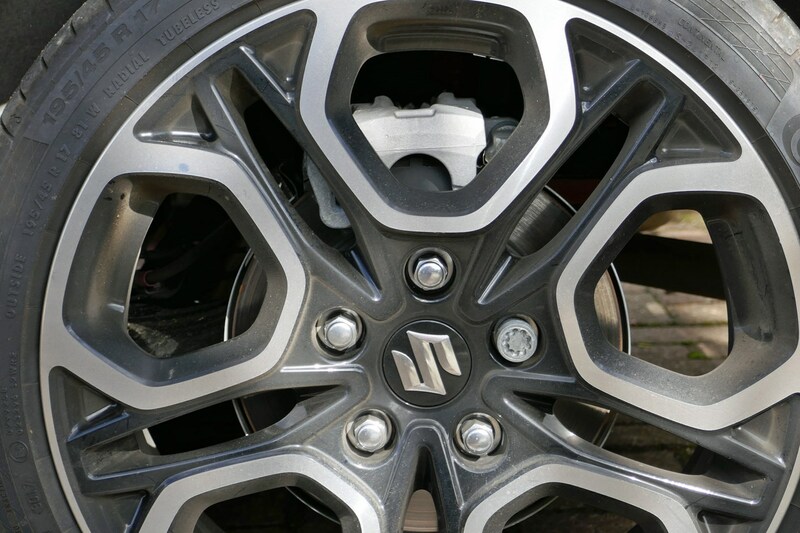 Inbetween measuring payload capacities in the office car park – or whatever an Editor of Vans does – CJ spotted that the rear brake calipers on the Swift Sport were positioned rather uniquely. 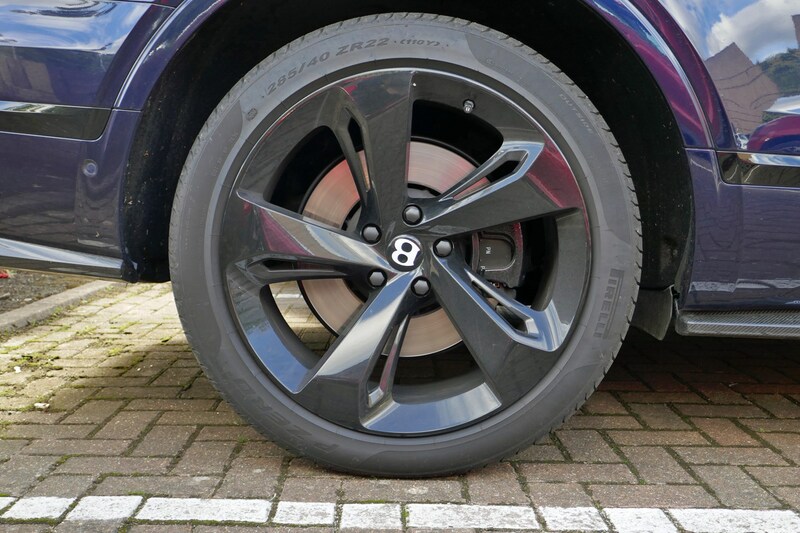 See, on most cars, the rear brake calipers are fitted in a 10 o’clock position or, sometimes, a 3 o’clock position (as seen on CAR Magazine’s long-term Bentley Bentayga). 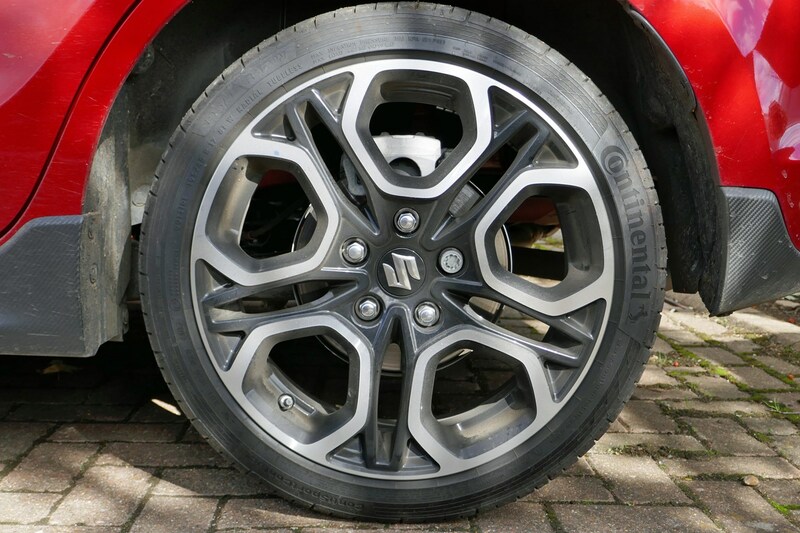 The Swift Sport, however, has its rear brake calipers mounted at around 12 o’clock. Why? Well, after much painstaking research (firing an email off to the Suzuki Press Office), I’ve discovered the reasons. Listed below, is the reply – from Suzuki – to my query. Unsurprisingly, weight saving plays a part, as does the cost cutting that goes hand in hand with this. The third point was what piqued my interest most, however. 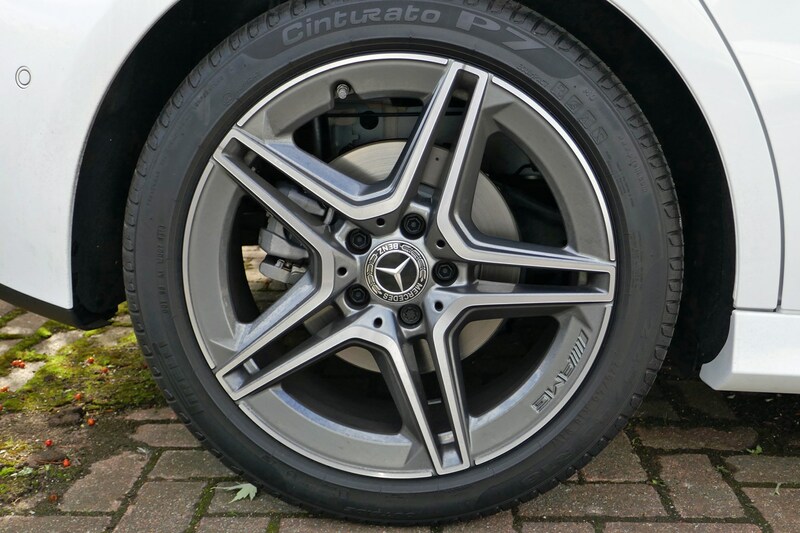 I’d noticed on a number of occasions that performance cars usually have their rear brake calipers fitted further towards the front of the car, but never known the reason why. Suzuki’s answer makes sense as the caliper is further forward than it is on the Ceed and Focus. Mounting it any further forward, in a Bentley-esque position, would only increase the amount of brake piping again. That said, I can’t help but think its lofty position would surely also have the effect of raising the centre of gravity. Regardless, it seems the 12 o’clock position is a happy medium between having a sportier set-up and saving weight and cost. Could I tell the difference if it was in the regular position? Probably not. Can Suzuki’s accounts? Probably. The Suzuki has been lacking something in recent days. Namely, air in its tyres. My Swift Sport long-termer is a rather nervous little car. 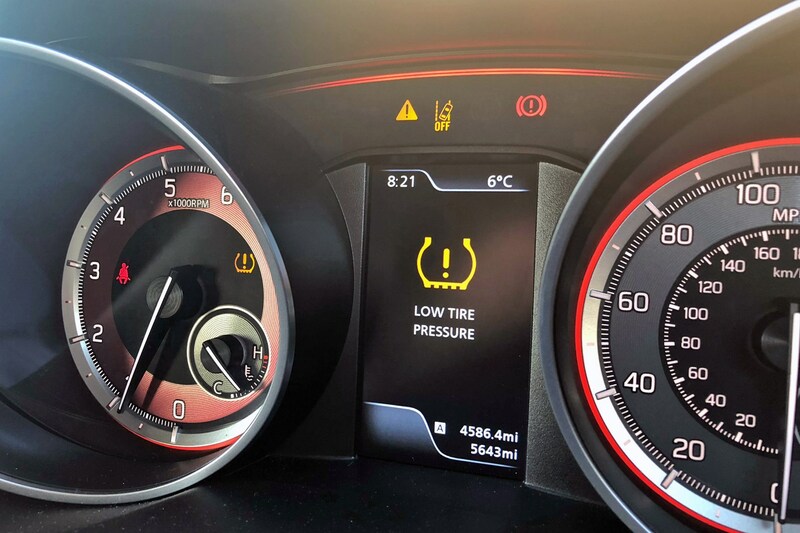 I’ve frequently been treated to the shrieking tones of its extremely sensitive Dual Sensor Brake Support (DSBS) system every time I close up on the car in front, but this week it’s been joined by another warning – tyre pressures. Thankfully, this one does not have any constant audio presence, but it does repeatedly flash up on the digital information display – and it can’t be acknowledged and minimised. Unless you activate the cruise control, oddly. 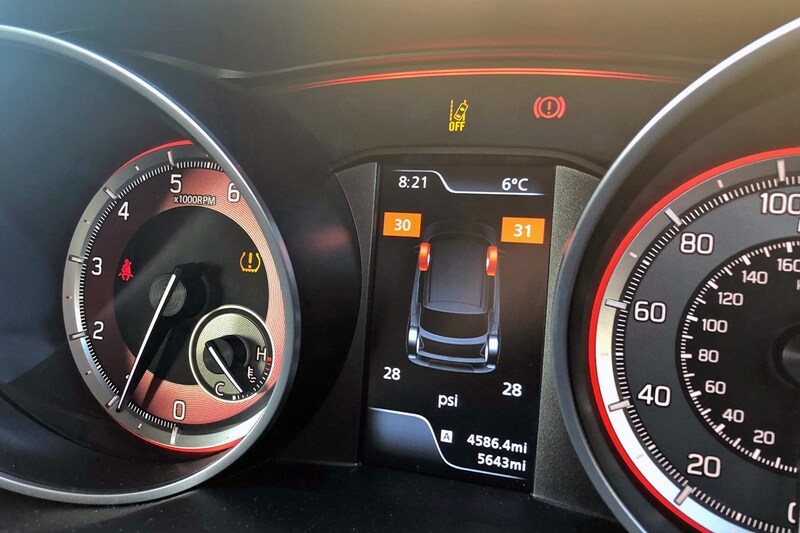 Anyhow, the car’s individual tyre pressure monitoring (TPM) system (a nice feature) initially showed that the front right tyre was slightly underinflated, and then shortly after the front left, too. I kept an eye on it for a few miles, and after deciding that the tyres weren’t losing air like a whoopee cushion at a hedgehog disco I carried on driving to work. Once at my desk, a quick scroll through Twitter revealed that other journalists running Swift Sports had suffered the same problem. 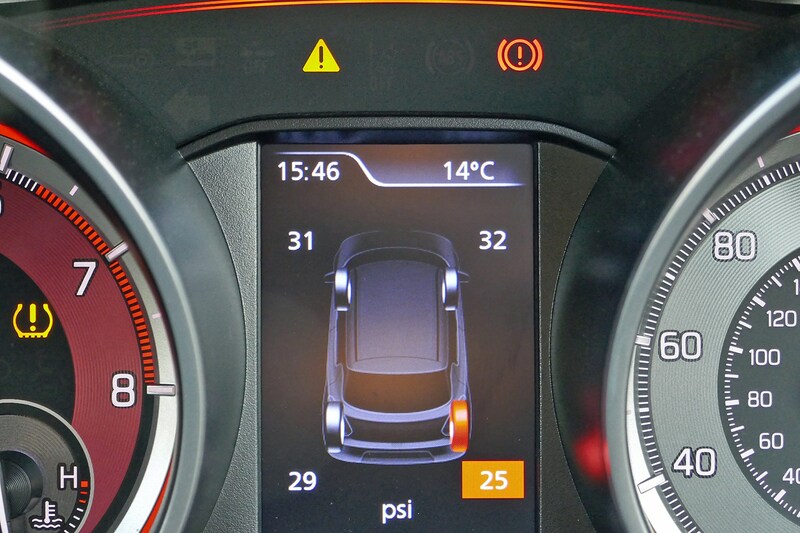 The cause, according to Suzuki UK, was the sudden drop in temperature affecting the pressures. Made sense, but to avoid any doubt (and to find out what the local Suzuki dealership is) I booked the Swift Sport into my local Stoneacres garage. 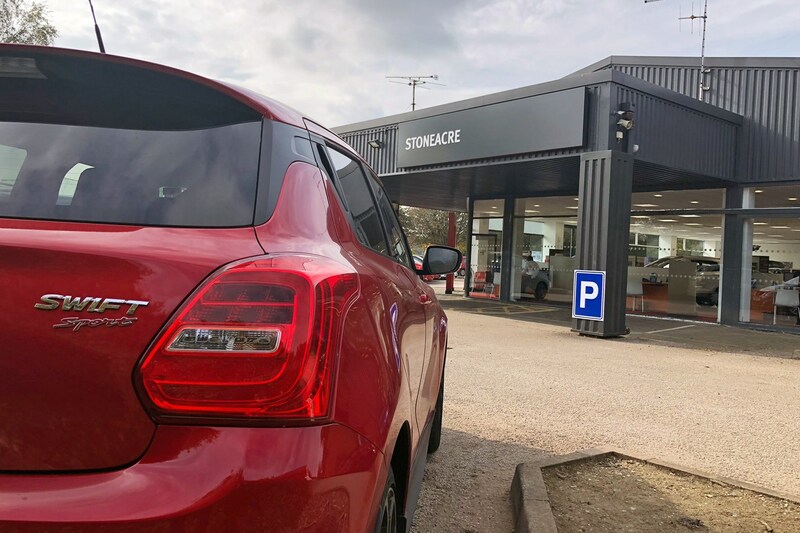 Although a little hidden in a maze of back roads around Peterborough’s Boongate district, the Stonearce Motor Group garage friendly and welcoming. Approaching the service desk, I was greeted promptly and offered a seat in the waiting area while my car was being looked at. Five minutes later and the car was ready to go, tyre pressure monitor thankfully reset. It was a slick experience that I – hopefully – shouldn’t have to go through again. Don’t get me wrong, the Swift Sport possesses a lively, punchy engine capable of surprising far pricier sports cars from the lights. And yet, I’ve never been able to shake a lingering feel that there was more to come out of the 1.4-litre Boosterjet engine. And, as luck would have it, a chap called Chris Cooke got in touch after seeing our Suzuki Swift Sport vs Ford Fiesta ST vs Volkswagen Up GTI drag race video, claiming he had a faster, more powerful version that we could use to topple the victorious Fiesta ST.
As tempting as another drag race would be, comparing a tuned car to a standard one is a little unfair, so instead I agreed to head down to Southampton to see (and drive) a more potent Swift Sport. 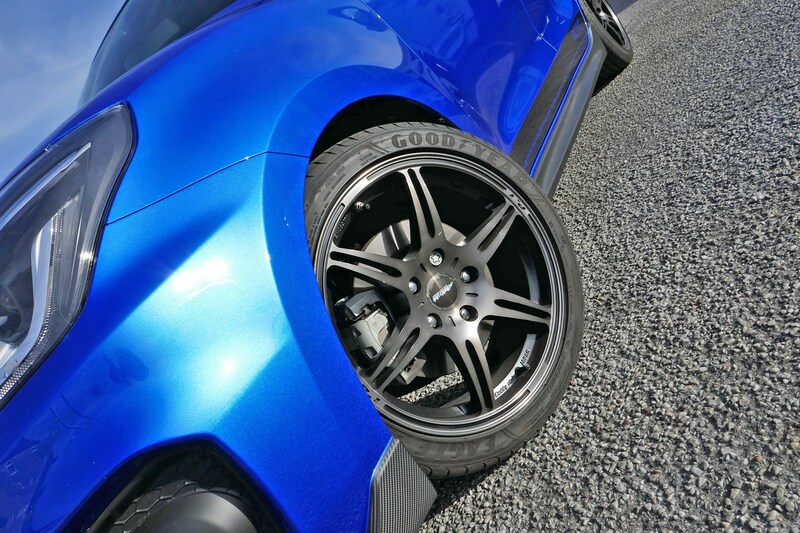 Chris is the director of a Somerset-based performance parts company CTC Performance, whom specialise in go-faster bits for the Suzuki Swift Sport. 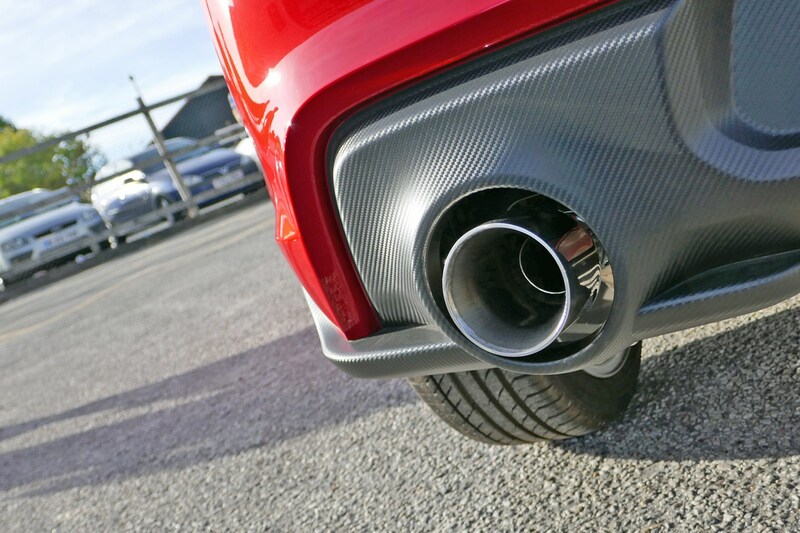 They offer a number of services – with more coming for the recently released fourth-generation model – including engine remaps, louder exhaust systems (pictured) and uprated suspension (blue car). What I’m most interested in, however – from a Parkers point of view – is the remapping service. Why? Well, it’s simple to do (just send the car’s ECU off to Chris and he does the rest) and the increase in power is immediate. 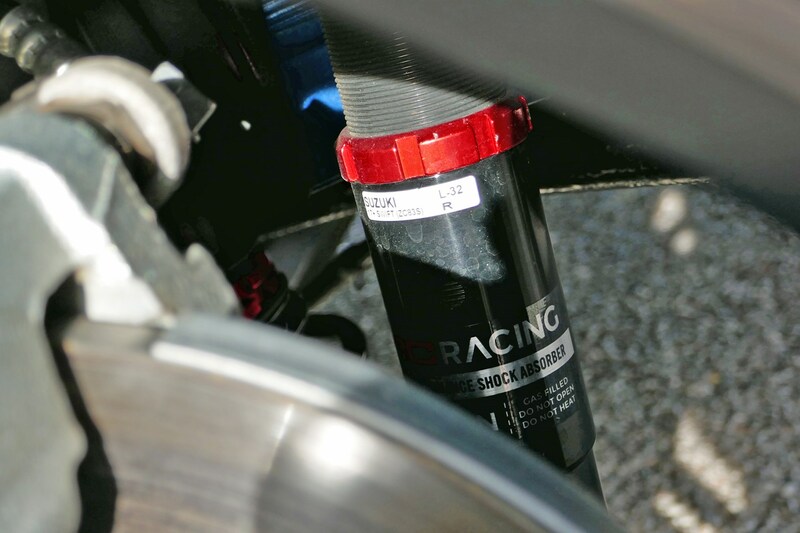 It works by reconfiguring the car’s electronic brain to tell the engine to produce more power and torque ­– something the manufacturer hasn’t (or isn’t able to do) for a number of reasons. 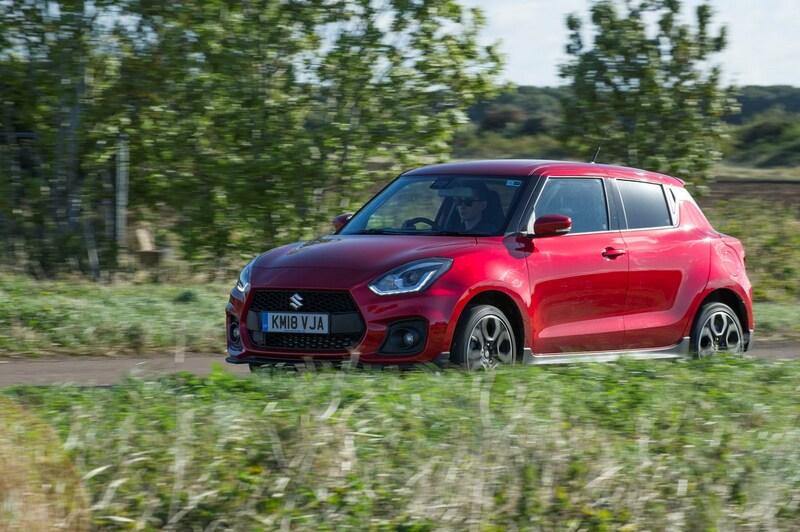 Suzuki claims that the Swift Sport makes 140hp from the factory, yet tests on numerous customer cars have shown this figure to be more like 152hp – a noticeable jump. 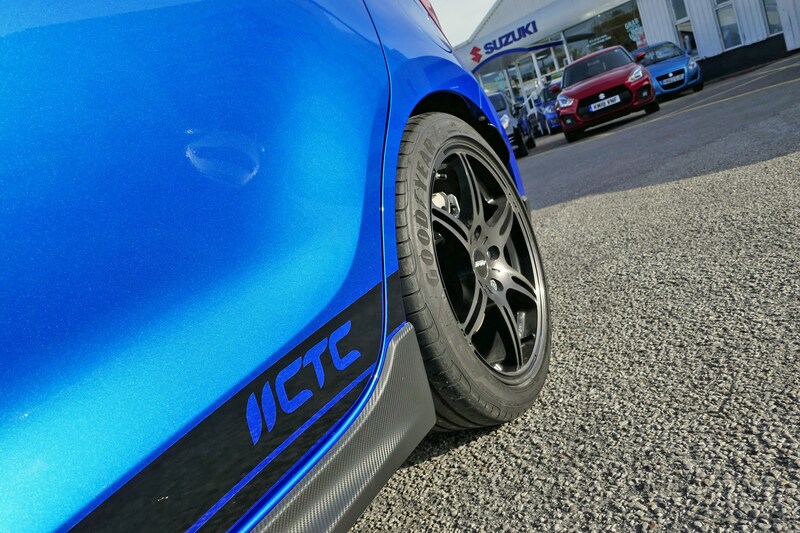 Give your Swift Sport the CTC treatment, however, and power jumps to 165hp, representing a 9% increase on the standard car. 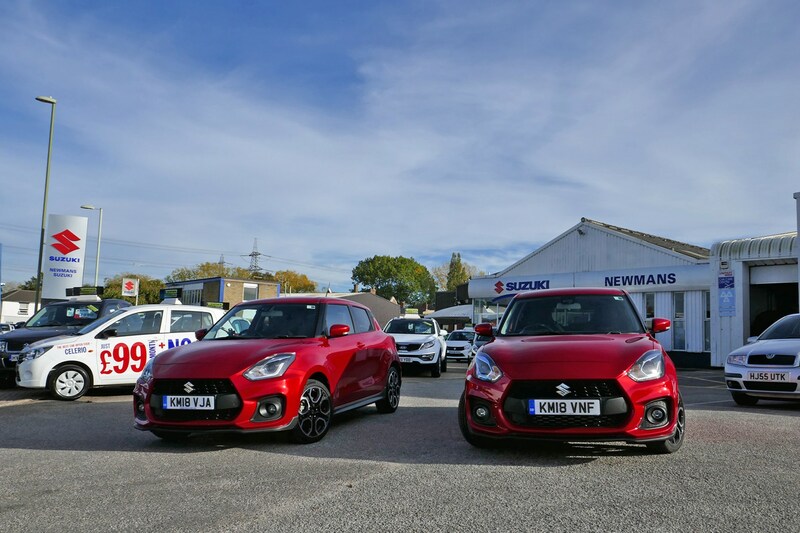 Newmans Suzuki in Southampton – who own the mapped Swift Sport – kindly allowed me to hop behind the wheel for a quick evaluation of the difference made by CTC’s fettling. Predictably, the map wasn’t able to turn the Swift Sport into a Focus RS. However, the increase in performance and driveability was noticeable. The engine felt more eager in the mid-range, with a better spread of torque pulling the car up towards higher speeds, all the while still feeling smooth and linear in its delivery. It’s not the sort of thing you’ll really appreciate over a short test drive, more an aspect you’ll be pleased to have invested in during many motorway commutes where the engine is that bit more flexible. The remapping process will set you back from £399.99, but – as it stands – you will have to negotiate with your Suzuki dealer on what this will mean for the manufacturer warranty. That said, Chris is trying to get the remap offered as a dealer-fit option, so watch this space. 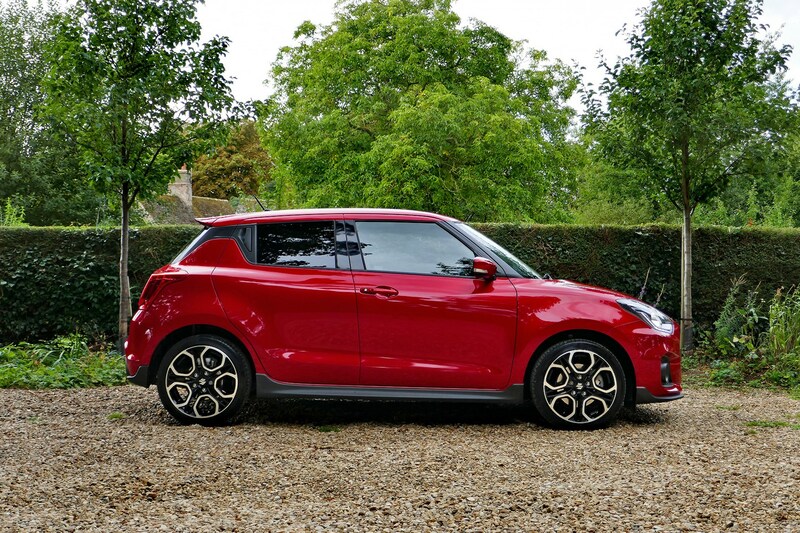 Last week’s update was all about the Swift Sport’s performance car potential – and how you can squeeze that bit more out of it for relatively little outlay. This week, however, we’re going to talk about fuel economy. You have been given fair warning. And yet, it’s not actually as boring as it sounds. 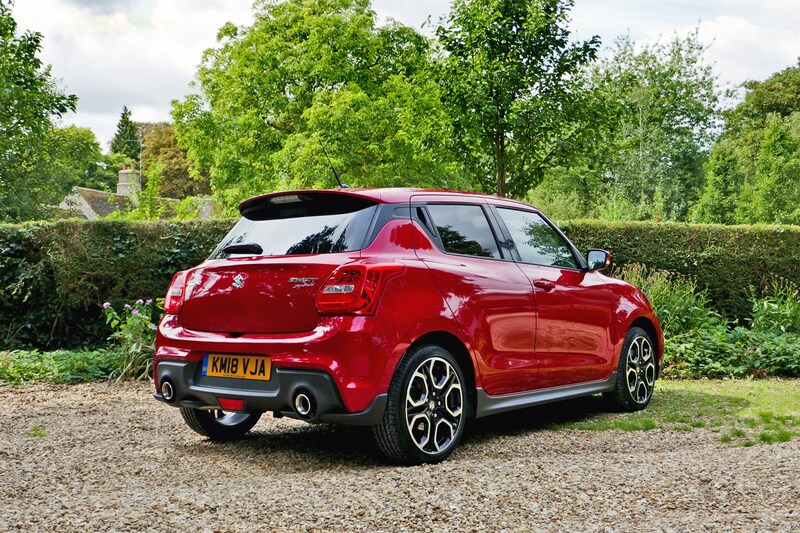 Chiefly because the Swift Sport can rely on its secret weapon to give itself an advantage in this department. Weight. Or lack thereof. See, not only does tipping the scales at 975kg improve performance, it also does a fair bit for fuel saving. How much? Well, the Swift Sport is currently averaging a healthy 42.8mpg (calculated) fuel economy figure and this is only showing signs of improving. It’s not like it’s been driven especially carefully, either – far from it. Forays to the rev limiter and trips into the congestion capital that is central London are frequent occurrences in this well-driven Suzuki. It’s on this latter point, however, that no amount of weight-saving can help when you’re sitting at yet another red light on the A219. 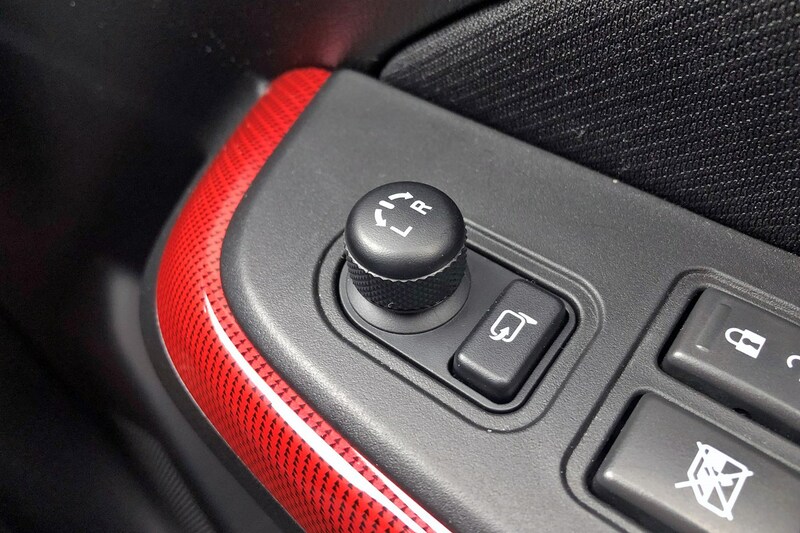 What does come in handy here is the car’s start-stop system. It works by shutting the engine off when the car is stationary and in neutral and quickly restarting it again when the clutch pedal is depressed. Sadly, the above readout isn’t displaying miles, but millilitres of fuel saved with the engine powered down. 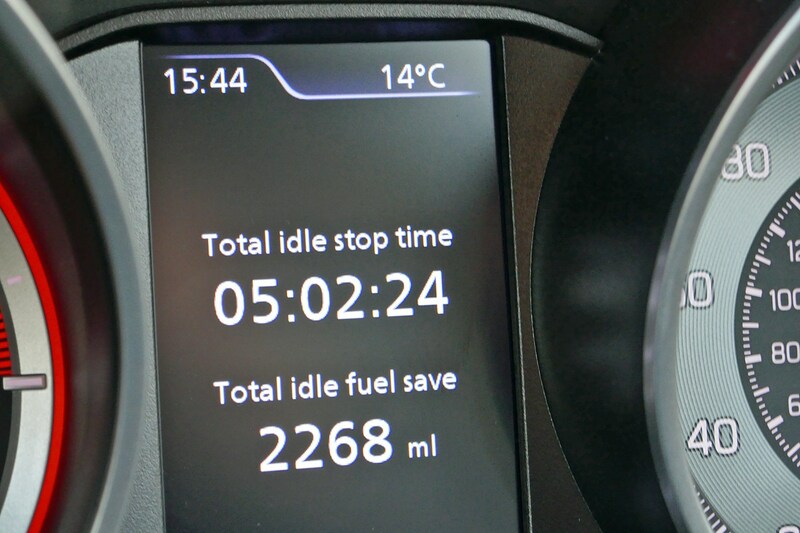 And, if we convert 2268ml into miles of fuel using our current average consumption figure, it comes out at 21.4 miles. Not quite the 2000+ miles I originally thought, especially when the car has been idling for over five hours in total! In other news, the tyre pressure warning light has reappeared, yet this time I suspect a slow puncture could be the cause. The right rear was pumped up to 32 PSI only a week ago, yet it’s already down to 25 PSI just over eight days later. Definitely one to keep an eye on. 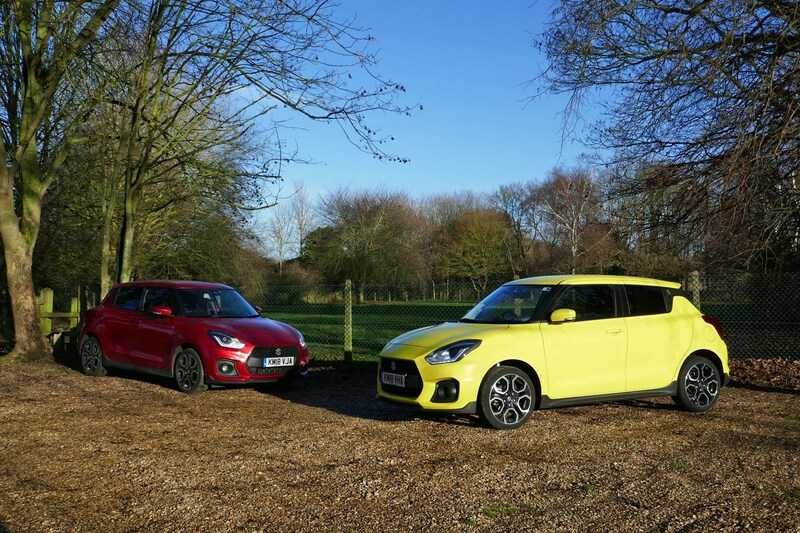 In my very first Swift Sport report, I brought up the issue of the Ford Fiesta ST’s tempting finance deals and how closely matched they were to the Swift Sport. Obviously, this was a big problem for the Suzuki, and it’s one I’m going to revisit several weeks later to see if anything has changed on the pricing front. How much does the Swift Sport cost on finance? When I first did this calculation in the summer, the Swift Sport came in at £310 per month on a 36-month contract. This included a £2,000 deposit and 12,000 miles a year allowance. Now, however, on the same fixed terms, the Swift Sport comes in at £289 per month – £21 less than previously (£252 over a year). That’s a hefty saving, and one that could just about swing the Suzuki into your price range. But how does it fair against the updated Fiesta ST prices? How much does the Fiesta ST cost on finance? When we first worked out the Fiesta ST’s finance costs a few weeks back, it came to £311 per month on the same terms as the Swift Sport. Again, things have changed somewhat. Buy a Fiesta ST (ST-2 spec) now, and you can expect to pay £333 a month with an optional final payment of £9,355. That’s a whole £44 a month dearer than the Swift Sport translating into £528 a year, while the final payment is £2,487 more. 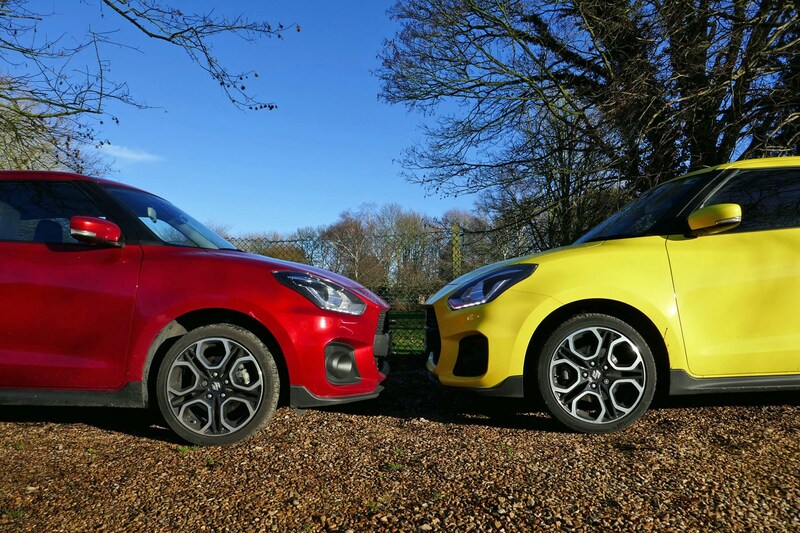 Obviously, such a disparity in the figures make it harder to genuinely compare the two cars – something that was far easier when we first did the calculations. As it happens, yes. 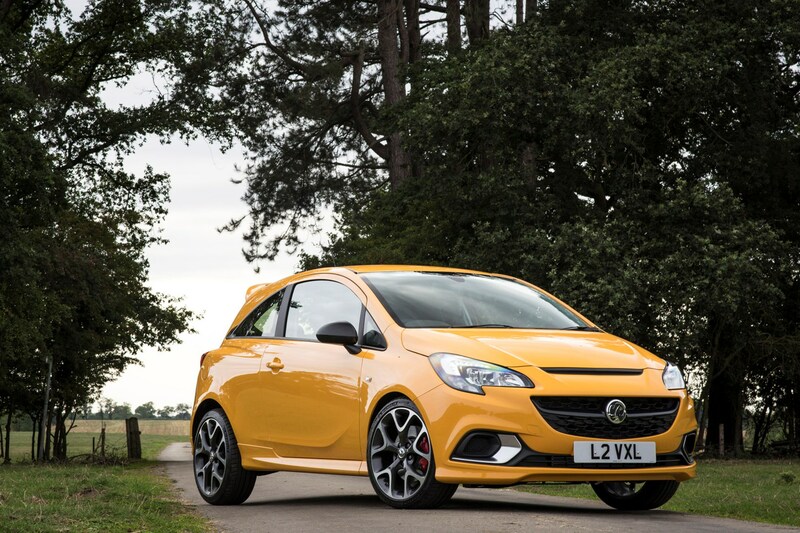 Since taking delivery of the Swift Sport back in the summer, Vauxhall has released its Corsa GSI warm-hatch, boasting 150hp and a suitably aggressive body kit. It’s on-the-road cash price is £19,920, but how does that translate into finance costs? Well, on the same contract terms as the Fiesta ST and Swift Sport, the Corsa GSI comes in at £305 per month with a £6,706 final payment. Such an outcome makes sense in theory, as the Corsa produces the middle amount of power in our trio of cars. Yet, it’s not quite that simple. 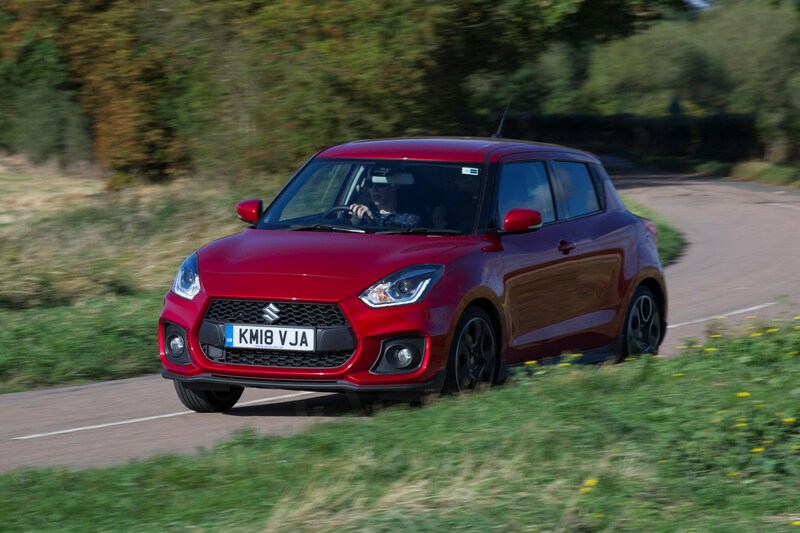 The Suzuki’s kit list far exceeds what’s on offer in the Vauxhall, plus, as we know after our update with CTC performance, my Swift Sport is more likely to be producing between 150 and 155hp, rather than the 140hp it claims. What’s more, Parkers Finance Editor Chris Lloyd has driven the GSI and reported back with words such as ‘mediocre car’ and ‘not particularly strong at low engine speeds’. Hmmmmm. What’s the takeaway from this? 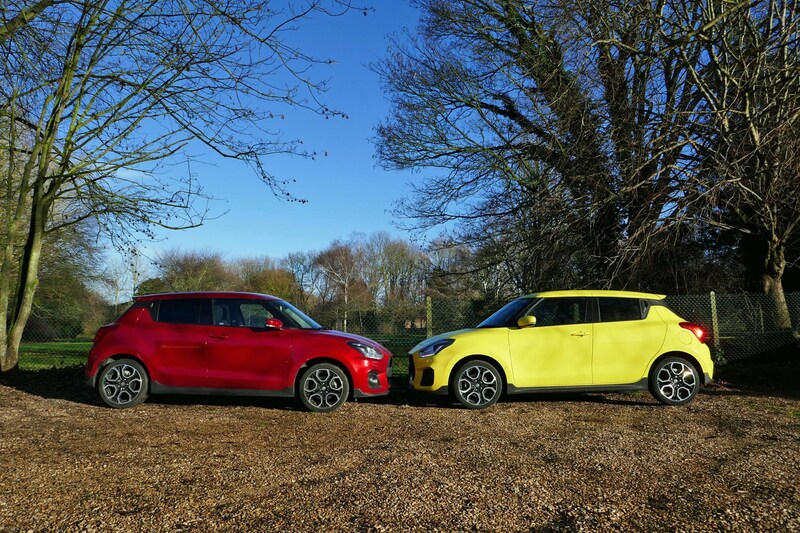 Well, despite a fairly inauspicious start, the Swift Sport is now noticeably better value on PCP finance, and while it could be cheaper still, it does at least sit far more favourably alongside its rivals. I can’t be accused of driving the Swift Sport within its comfort zone with the type of driving I’ve been subjecting it to. Most have been long, tedious, motorway jaunts to and from the Parkers office – near Peterborough ­– back to my home in west London. So no twisty B-roads to scythe down and no narrow city streets to dart my way through. The poor car hasn’t known what’s hit it. 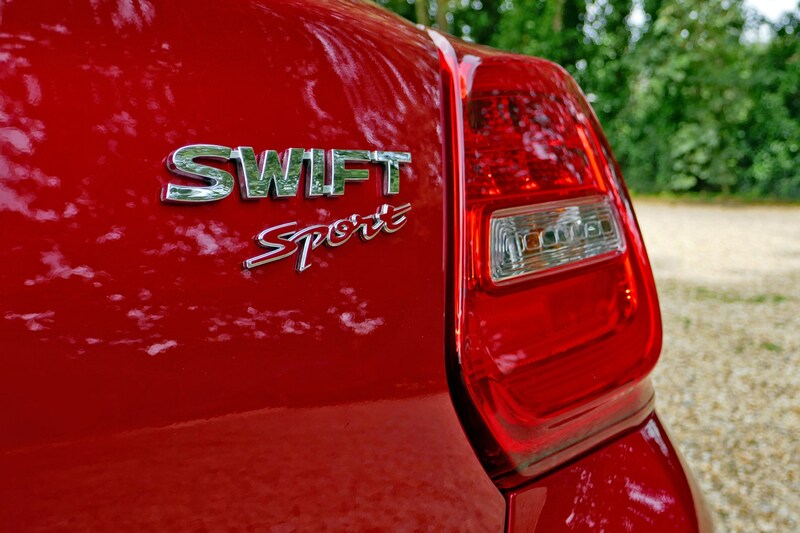 How has the Swift Sport fared? Surpisingly well, as it happens. The torquey 1.4-litre turbocharged Boosterjet engine gives plenty of low-down pulling power and means in-gear motorway overtakes are a doddle, plus the high-speed ride and refinement are perfectly acceptable. Adaptive cruise control and lane guidance tech has also proved its worth in the many average speed check zones on the A1. What’s more, the recent Apple CarPlay update means I can stream the Waze sat-nav app through the car’s infotainment screen – a big improvement over the standard system. Fuel economy has also been a nice surprise, averaging 43.1mpg despite not being driven especially gently for the majority of the loan. 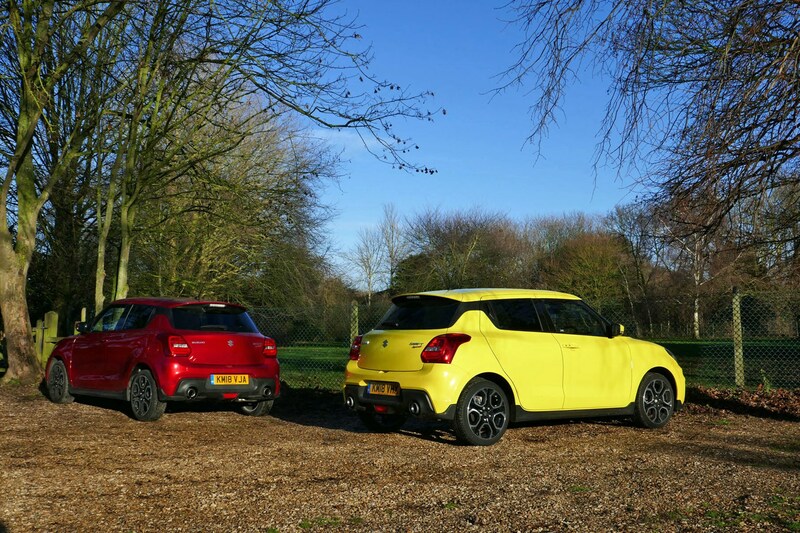 As is often the case with the Swift Sport, this can largely be put down to the sub one-tonne kerbweight. It can’t be perfect, though? No, not quite. The seat, although seemingly comfy when you first get in, lacks the outright lumbar support for long journeys. It’s not crippling, but does become uncomfortable after an hour’s solid driving. There’s no armrest either, which makes finding a place to rest your left arm when you’re not changing gear tricky. 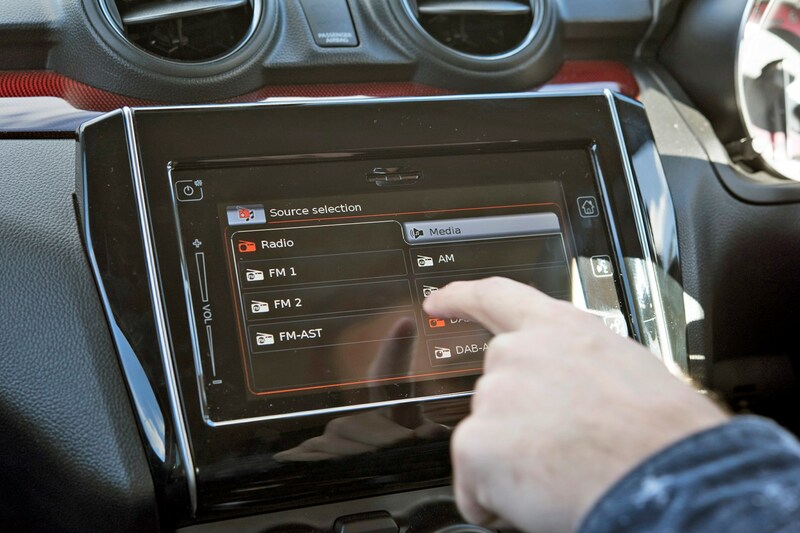 The stereo system could also be a touch beefier. It’s not that it’s not loud enough, more that the quality is lacking, and when you’re listening to it for up to four hours every day, such complaints quickly become tiresome. Not quite the perfect score then, but the Swift Sport has more than enough about it to mean I don’t turn up to work fed up, uncomfortable and tired (maybe the latter) every morning. And, if Suzuki were to fit more supportive seats and a high-end sound system then it’s basically an S-Class, right? It’s rare that you find a car where absolutely nothing annoys you. In fact, in my two-and-a-half years doing this job, I can’t remember one where everything was perfect. So, somewhat unsurprisingly, I’m now going to list the elements of the Swift Sport that have got on my nerves over the last few months. This may sound like a small, overly fussy complaint that I wouldn’t have even made if the car didn’t have electric folding mirrors. 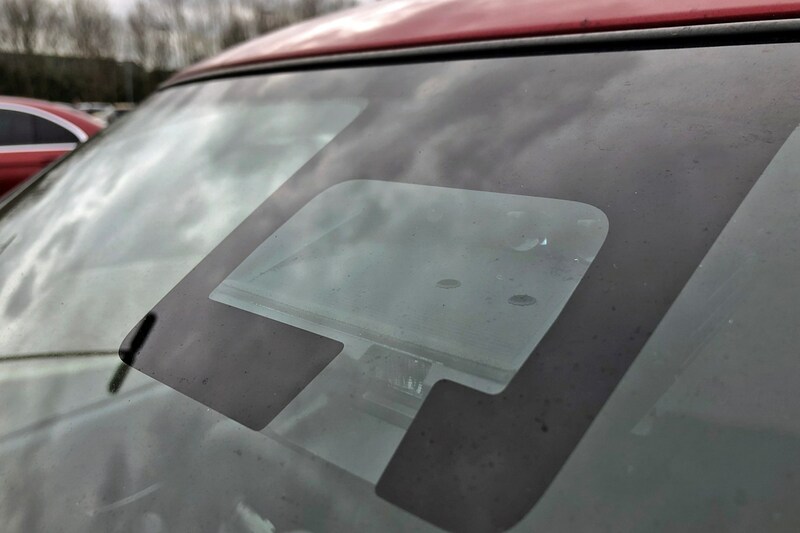 But the fact is that it does and for some peculiar reason they don’t automatically fold inwards when you lock the vehicle and return to their normal position when the engine is started ­– like they do on a vast number of other cars. Instead, you have to flick a button near the electric window switches every time you want to fold or unfold the mirrors. 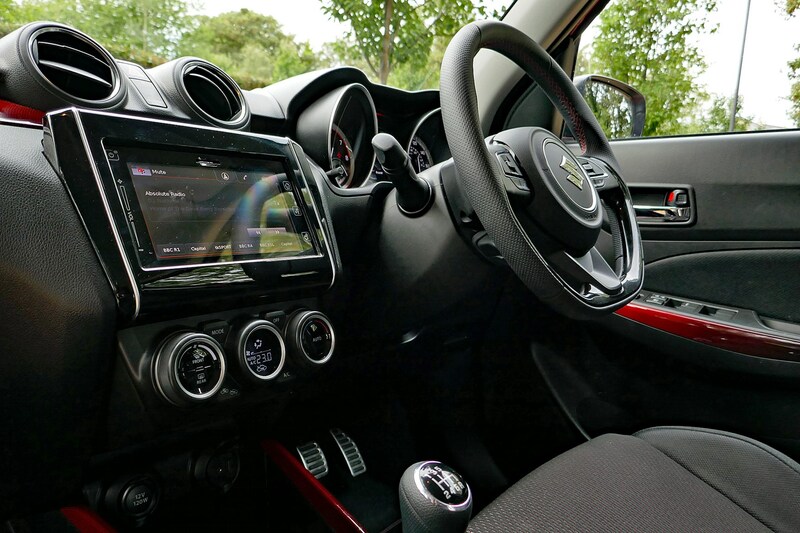 Surely, if Suzuki has gone to the expense of putting electric motors in the mirrors (not to mention the additional weight), it would have been but a mere extra detail to make them work off the key? 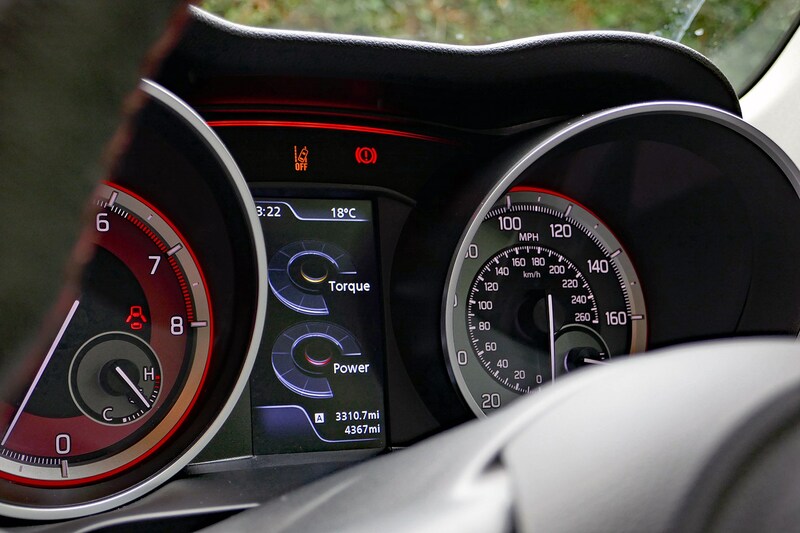 There’s several different graphics available on the Swift Sport’s digital dashboard display (including my personal favourite, the torque and power meters) yet not one offers a digital indication of speed. This a rare on a modern car and it’s not hard to see why. 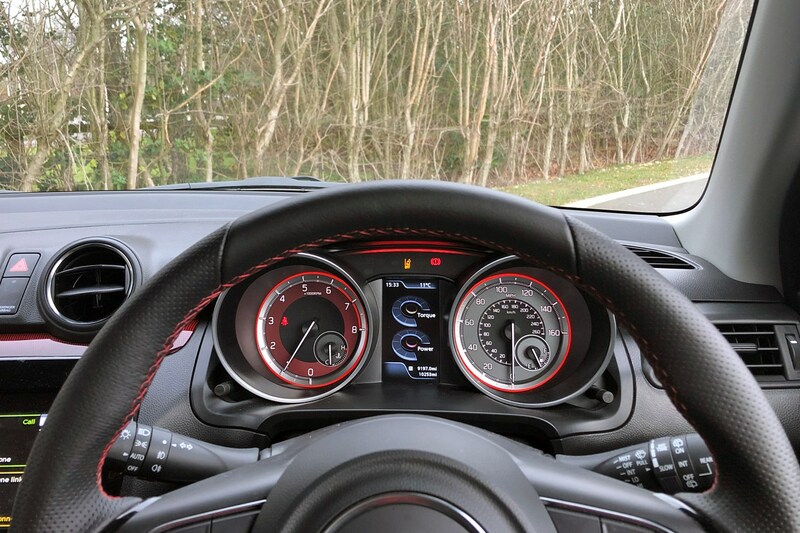 For me, they’re far easier to read and mean you spend more time with your eyes on the road – especially since the Swift Sport’s analogue dials aren’t exactly the clearest. Again, this comes down to a case of Suzuki doing the hard part but then electing not to add the final detail that would have made a notable difference. Disappointing. I’m all for safety tech that saves lives and lowers insurance premiums. And I don’t doubt for a second that Suzuki’s version of autonomous emergency braking (Dual sensor brake support) does both. However, I’d have genuine concerns that many owners would end up simply deactivating the system because of how ludicrously sensitive (and annoying) it can be. Only the slightest bit of provocation (i.e. 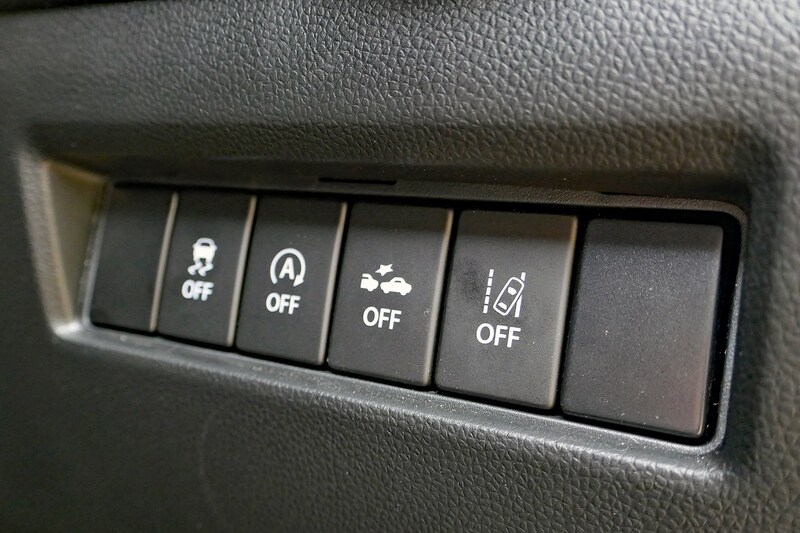 approaching the rear of another car in traffic) elicits the shrill beeping that warns you of a ‘possible’ collision. I’m not the only one to have noticed this, either. 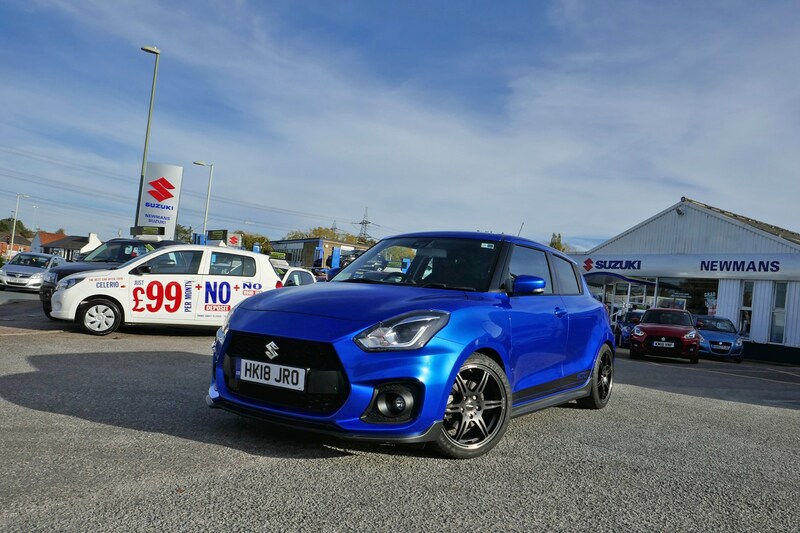 Colleagues from CAR Magazine who have ran either a regular Swift or the Swift Sport have also noticed the issue, not to mention it also being present on the demonstrator I drove at Newman’s Suzuki a few updates back. Yes, this is a comparatively cheap car but rivals costing similar (or less) manage to provide better systems. It’s incredibly difficult to use on the move thanks to an inconsistent touchscreen and fiddly menus, while responsiveness isn’t much to write home about, either. On the plus side, I’ve no complaints about the number of functions or reliability of the software – it’s not crashed on me once. Complaints over. Tune in next week for a considerably more positive report where I conduct a Swift Sport swap with our friends over at CAR Magazine. Here’s a question. How similar are two supposedly identical cars? Same make, model, year. Even similar (very low) miles. 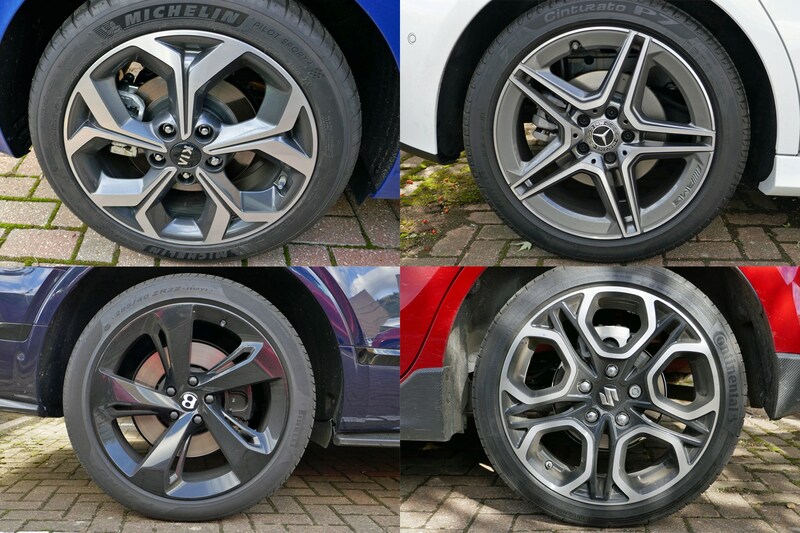 It may seem like there's only one answer, but having spent the last three years reviewing new cars, it’s amazing the variation on show across different examples of the same car. Why is this important? Well, for starters, it gives you a good idea on the level of quality control found at different manufacturers. If one car comes off the production line with a super slick gearbox and the very next one along feels baggy and notchy, something’s going wrong. And what’s more, would you be happy knowing that despite paying exactly the same amount as a customer on the other side of the country, their car is tangibly better than yours and doesn’t have that annoying rattle from the boot lid that you can’t quite nail the source of. With all of the above in mind, I arranged to swap my Swift Sport long-termer with CAR Magazine Online Editor Curtis Moldrich for a night. And yes, although the eagle eyed among you will have noticed that the two cars are different colours, they are otherwise identical. So what was the result? 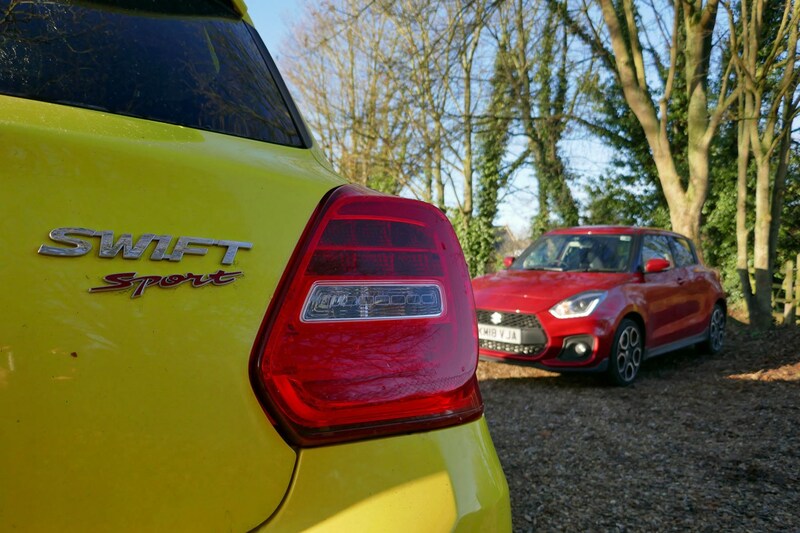 I took the shocking yellow (sorry, Champion Yellow) Swift Sport for a night and wasn’t sure quite what to expect. Would it feel noticeably different to mine? Would the engine have loosened out better, or the autonomous emergency braking system (AEB) not be quite so sensitive? No, who was I kidding. 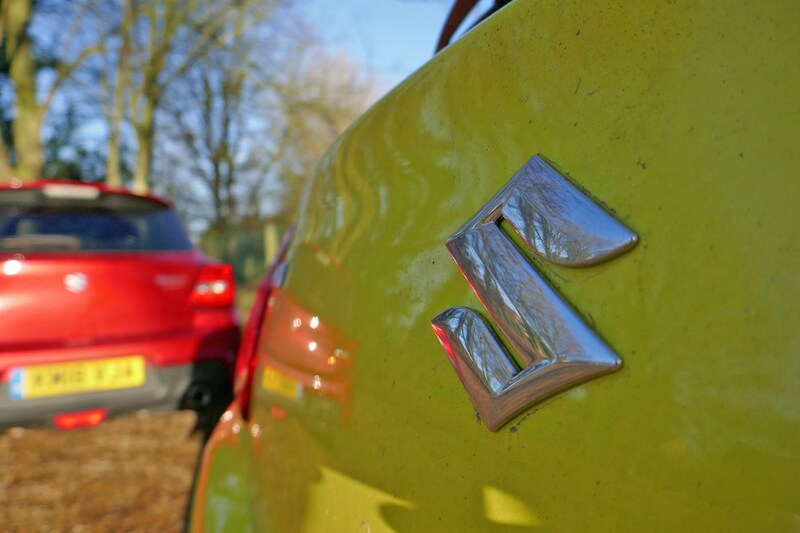 This is Suzuki after all, currently makers of some of the most reliable cars in Britain. The yellow car was as tight and solidly made as my red runaround, despite a few thousand miles of hard labour on the odometer. Not a squeak or rattle in sight. And the AEB was still hyperactive. While you might think this par for the course, we’ve driven countless £50,000+ test cars with build quality issues after just a few thousand miles. That said, I did think the engine in the yellow car was that little bit perkier than mine and the gearshift a smidge lighter. Going back a few months, the former could be explained by CTC performance’s claim that every Swift Sport they’ve tested produces between 150 and 155hp, not the claimed 140hp. Either way, you’d have to really concentrate to notice the difference (and yes, this was on a full tank of fuel), as the two Swift Sports were – for all intents and purposes – identical to drive. Top marks to Suzuki build quality, then. Tune in next week for the penultimate update, where I find out what the rest of the Parkers team think of my Swift Sport long-termer. 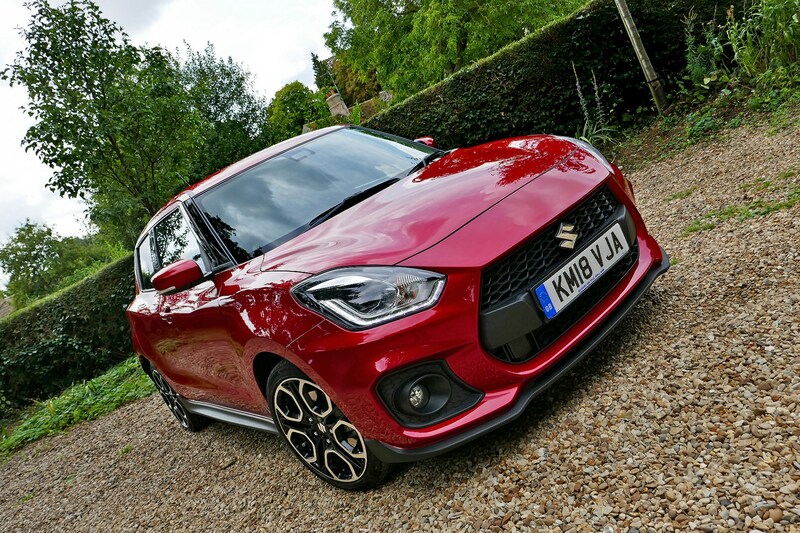 I’m now onto the penultimate update for my Suzuki Swift Sport, and I thought rather than hear what I have to say for an 11th report in a row, I’d find out what the rest of the Parkers team think of the red rocket. Opinions, both positive and negative, can be found below. First up, Tom Goodlad, a beacon of sensible and measured evaluation on the Parkers team. Not that that’s stopped him giving my poor Swift Sport a pasting. Gareth Evans gave an opinion, but he’s now left to provide maternity cover as MCN Online Editor, so he’s dead to us. 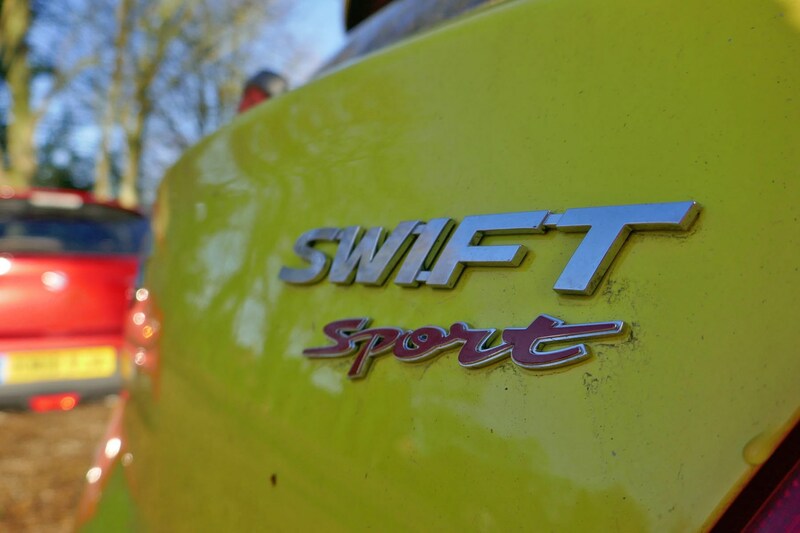 My first few experiences of the Swift Sport left me wanting, for one very good reason: I only drove it on race tracks, and both times it was out-gunned by everything else in attendance. It was months later when I finally started to understand what it was all about, when I took it on a Saturday blast to meet CJ at a new burger location we wanted to try. On a damp day in December the Sport’s fabulous match between chassis and engine performance really shone. The control weights are great, too, and the note from the engine never fails to elicit a smile. My only major criticism is that turbo motor does spin the wheels a little too easily at low speeds, which isn’t going to concern many drivers unless they’ve experienced the previous car and its almost linear power delivery. Serial sonneteer Richard Kilpatrick continued his tradition of writing poems about my long termers with a touching piece on the Swift Sport. Lawrence Cheung has actually gone out and bought a Fiesta ST with his own money, so he’s not biased at all. I like the Suzuki Swift Sport. I don’t get some of the negativity around this current-generation model. Yes, we all loved the naturally-aspirated engine of the old one, but there wasn’t that much reward at the top end; it wasn’t exactly VTEC was it? The engine’s smooth, torquey power delivery serves up enough punch and while the red-line is laughably low, it does sound nice and throaty around 4,000rpm. Shame you can’t hear the twin exhausts inside the cabin. The soft ride makes it great as a car to use daily but the cabin refinement does not. The stereo fails to drown out the level of noise filtering into the cabin at motorway speeds and the speakers sound maxxed out as it is. Also, why does the trip computer clock have to be set separately to the touchscreen? 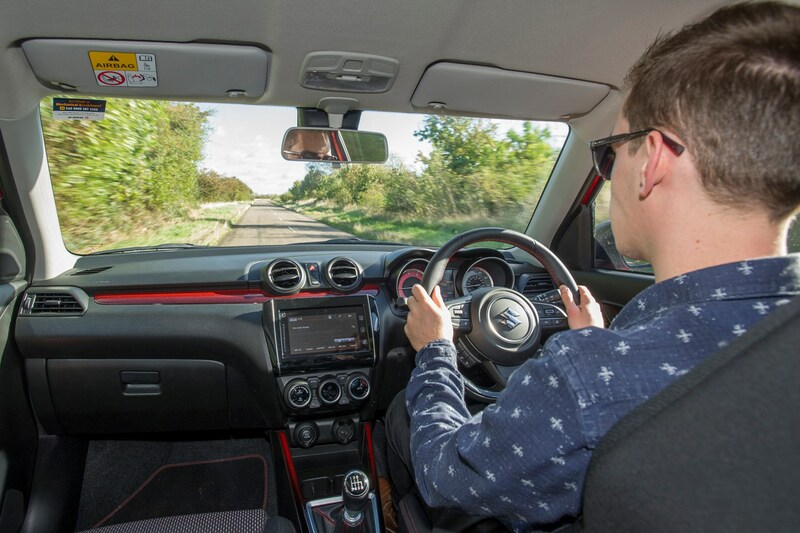 Yes, there are some foibles with our long-termer, but the car’s a likeable thing to live with. End of. The bit that you can’t forgive it for though, is the price. 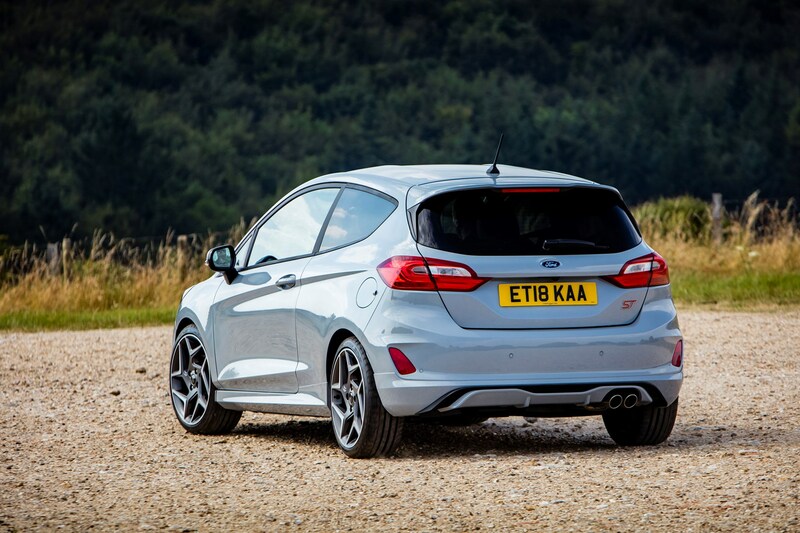 It’s not a patch on the Fiesta ST but look at it this way – you could exchange your money for a Vauxhall Corsa GSi and spend the rest of your time weeping. Last but not least, Adam Binnie. 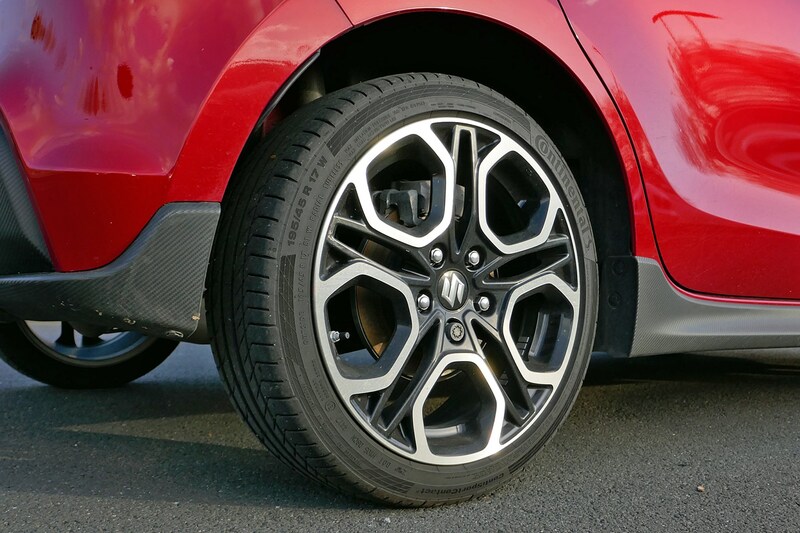 He’s single-handedly responsible for the worrying lack of tread on the Swift Sport’s front tyres, all in the name of ‘helmsmanship’. 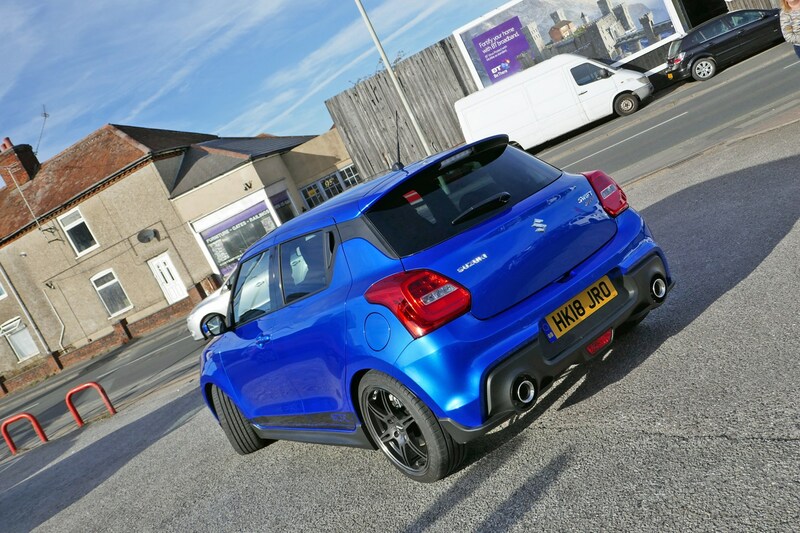 The Swift Sport feels loads quicker than the old car but as an experience it’s not as involving – previously you had to work the brilliant chassis hard to maintain momentum and now it’s just a case of giving it a big boot of gas on the corner exit. 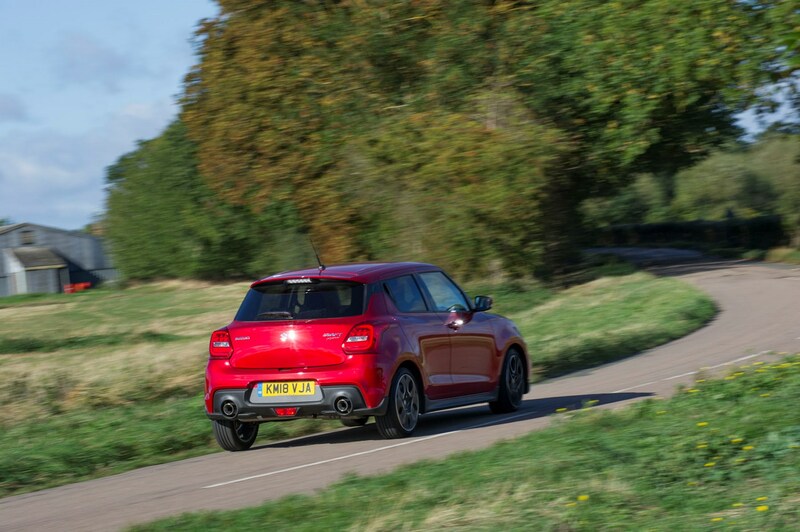 That’s not to say it’s not an enjoyable thing to drive, it’s just different, and there are new charms – not least the ease with which you can surprise larger and more powerful hot hatches. The lack of weight is apparent from the off and the brakes are also fantastically strong, plus it looks a lot less like it’s been cobbled together with an aftermarket bodykit. I’d have one over an Up GTI but not a Fiesta ST.